As I just happen to have the book in question kicking around under my desk, I'll save Stephen the effort. I don't think the Stilicho hilt furniture looks like Sasanian at all, but I do have to admit that what we can see of his scabbard does bear a marked resemblence to one of the Sasanian carvings at Bishapur. "If a Greek can do it, two Englishman certainly can !" Thanks for attaching the pics Matthew. As I said above I'm not entirely convinced of the swords Iranian origin, but depending on which way you interperate it, I can the possibility. 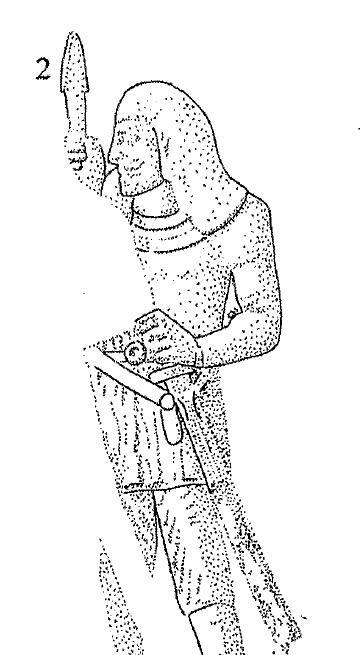 To me this arguement rests on whether you interperate the sword to have a small upper guard between the grip and the pommel, or whether it's merely a ferule bellow a mushroom shaped pommel like on the reconstructed sassinian sword posted by Matthew. One thing that I find very strange, is the shape of the grip. Unlike most Roman grips with their carved finger ridges, it has an almost vase shaped grip, has anyone here every seen anything like this elsewhere? One thing that I find very strange, is the shape of the grip. Unlike most Roman grips with their carved finger ridges, it has an almost vase shaped grip, has anyone here every seen anything like this elsewhere? I visited the National Museum in Budapest a few years ago and took a pic of this group of Avar swords. Unfortunately it was with a 2nd generation digital camera which lacked a decent autofocus, so it's not the best pic in the world. However, the sword on the right, despite it's typical two point Avar suspension, has hilt furniture that looks like it might be close in style to the Stilicho sword. If anyone's got a better picture or more info on this one, I'd really appreciate it as I've yet to pursuade my partner that she'd really like to go back to Hungary for a weekend break. There must be the fate, but now I am researching academic literature, and other sources, that could reveal how were the visigoth swords after the Migration times. I refer the so-called Regnum Gothorum of Toledo, and, especially, from the sixth century till its end, at the year 711. It's, really, a difficult aim (or a mission impossible), because there are very few remains of visigoth weapons well preserved in the Iberian peninsula between fifth and eight centuries. First, because the habits of the Visigoth people who settled in Hispania were very different from those of the other Germanic communities: eg, it was common that the ritual offerings in the graves were humble, even if the dead were of high rank people, only some food, the civilian clothing, and little else. Second, for the Mediterranean climate, that is enough dry for maintain our soils in an oxidising environment (here, in Spain, we don't have nor anaerobic, nor reducing conditions, as in northern Europe); then, iron remains and organic objects disappear quickly. So, we just can have some sword blades, and only one or two hilts, always incomplete. Despite this grim picture, I hope to reach some conclusions as soon as possible. In this thread, Felix Kunze posted pictures from a sword found in Boe, Norway, which also bears a lot of similarity to the "Stilicho" sword. Ahh, thanks for that Paul...an interesting shape but not curved as I thought it might be. I don't think that the 'Illerup/Boe' style of hilts are what we're looking for either (gorgeous though they are). The most distinguishing feature of the Stilicho dyptic sword is the way that the grip curves in at the bottom before the guard. As Stephen said "almost vase shaped". It's a shape you see on some small sword grips of the 18th century but not on swords of the late Roman/early migration period. Perhaps it really is just artistic license? Not that I'm saying that this has anything to do with Stilicho's sword, but it does have a similarly shaped grip. 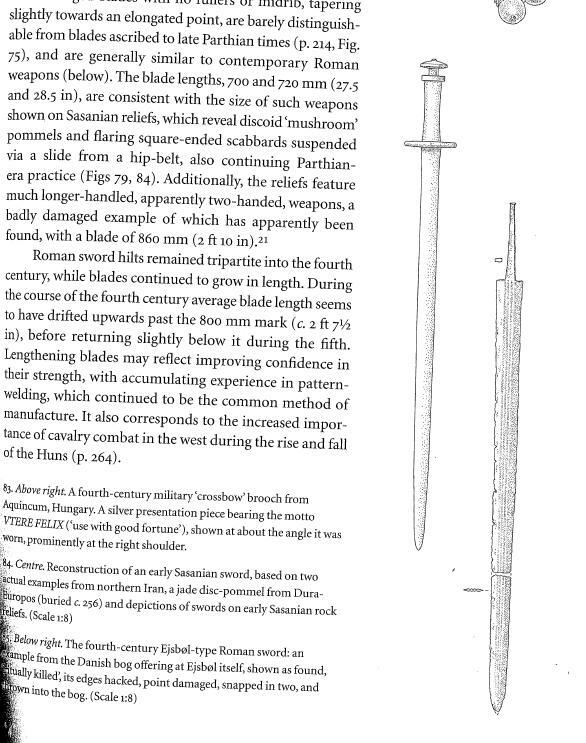 At least the Boe sword may have a somewhat similar lower guard / pommel configuration. But you are right, it's not conclusive as the vase shape is missing. The reference to the Xiphos is interesting, and if we go for "artistic license" that could be it. But I keep thinking that I've seen similar Sassanid swords somewhere... But where??? P.S. I hope you both have received the pics. Let me know if you haven't. Hi Paul, funny I had the very same thought about the similarity of these Avar swords to those of the Han, it's possible that the Chinese swords influenced those of the Avar, and other Eurasian steppe nomads, the same way as the Chinese borrowed the idea of the P shaped scabbard mounts from the steppe nomads. Oh and I recieved you'r email Paul, thanks very much for the pics. I had sent you a reply but I just noticed that the email has failed, so I've sent you another one. Another thing that keeps bugging me is the apparent similarity of Hun swords and Han jian. Although the fittings are usually different, the blades are quite similar. Well my boss is going to be none to happy with you as I spend the rest of the day perusing pictures. I however thank you from the bottom of my heart! Maybe strange, but for a moment I really thought you were talking about a shield boss rather than a manager. Anyway, your thanks should go to Jeroen. Thank you Paul I love Jeroen's site. So many things to admire, ponder and revisit over and over. I remember the first time I came across it. Must be years ago now But i go back often and just browse. We live in such great times to have this kind of access to the past. It truly is a master class to just devote yourself to going through these collections more than once and find the things that speak to you and pursue them. Thanks Paul for the reminder of Jeroen's site, I haven't looked at it in a while. I never noticed that there were pics from Krefeld on there. Do you happen to know what the grip material of the gold and garnet, ring pommelled sword? Looks like bone to me. Completely by accident I stumbled across some pictures of a reproduction of the Avar swords from Hungary.